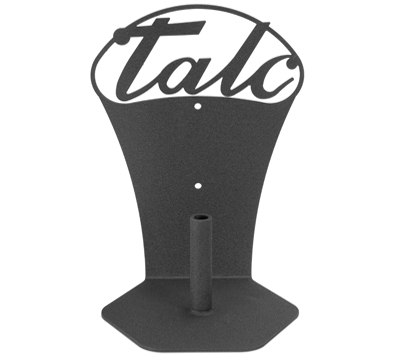 Tough as nails, easy on the eyes, you haven't seen anything like this black powder-coated steel cone talc holder. It displays "Talc" in a fancy script that blends perfectly with the rough black powder-coated steel. It is precision machined from 12-gauge steel and its rugged texture comes from the black powder coating that makes it so unique and sturdy. The powder-coated surface will stand up to the toughest of treatment, whether in a home game room or a commercial establishment. The cone talc holder measures 7.5" W x 10.25" H. Hardware included.